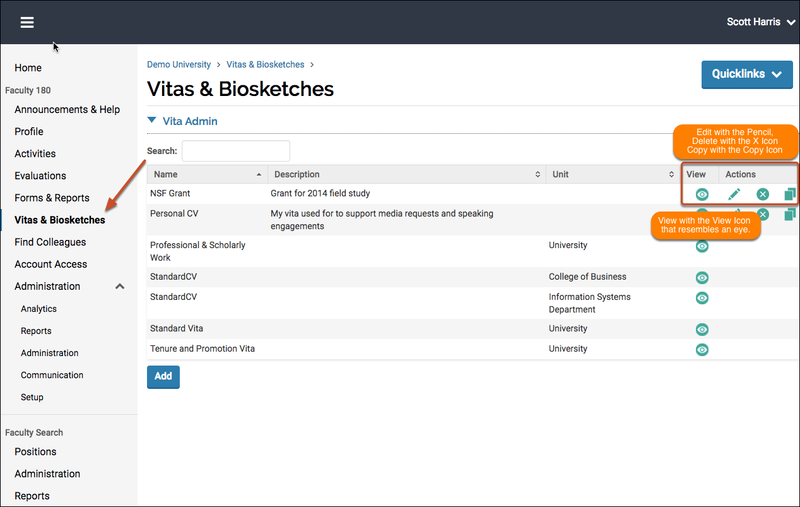 The Vitas & Biosketches feature in FACULTY180 allows a software administrator to create institutional vita templates for various purposes. 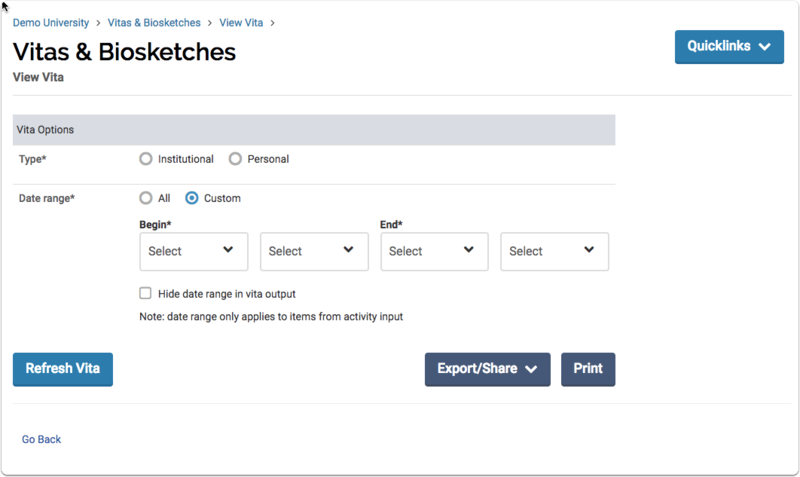 Faculty members also have the option to create a personal vita template or a biosketch from pre-designed templates to support applications for grants/contracts, including the NIH, NSF, and USDA. In addition, generic templates can be created for other agencies. Click Vitas & Biosketches on the Navigation menu. The Vitas & Biosketches screen displays. From here, you can add, view, edit, delete, or clone a vita or biosketch. Once cloned, they are a personal vita template of that faculty user. Personal vitas currently have limitations in features and capabilities. Institutional vitas set up by your administrators are best or exporting to a Word document before customizing. On the Vitas & Biosketches screen, click Add. The Add dialog box opens. Type a name for the new vita/biosketch in the Name field. 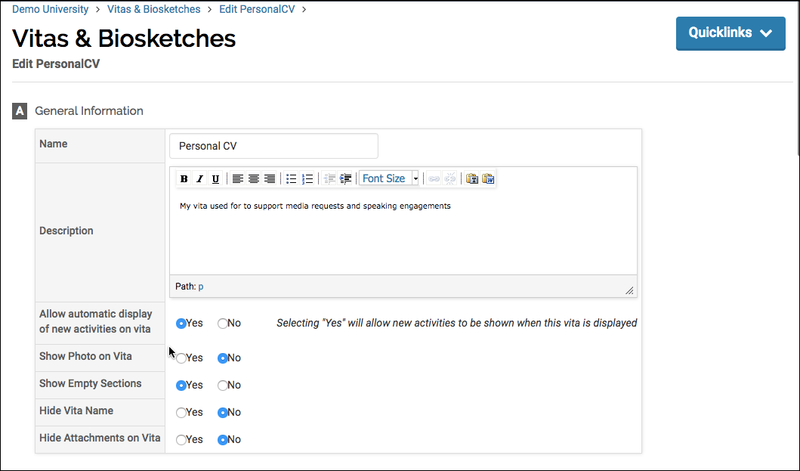 Use the Template drop-down to select a template for the new vita/biosketch. The default vita template is indicated with an *. In the Description box, type a description of the vita/biosketch if you choose. To view the new vita/biosketch, click the View icon. The View Vita screen displays the selected vita. If necessary, change the type of vita/biosketch, the citation format, and the academic term(s) for the vita/biosketch you wish to view. FACULTY180 allows you to share an electronic copy of your vita/biosketch with others. Click the Share Electronic Copy icon and FACULTY180 will provide you with a unique URL for your vita/biosketch. Settings by your institution can affect your ability to share specific information. Contact your FACULTY180 Administrator at your institution for more information. Once you have created a vita/biosketch, FACULTY180 allows you to select the type of information to display in the vita. For example, you may only want some of your activities to display in your vita/biosketch, depending on how you intend to use it. You also have the option of allowing new activities to automatically display on a vita, and to show your photo on a vita. To edit a vita/biosketch, click the Edit pencil icon adjacent to the vita/biosketch you wish to change. The Edit screen displays. Allow automatic display of new activities on vita: Specify if you want new activities to automatically display on your vita. Show Photo on Vita: Specify if you want your photo to display on your vita. To select a photo, click Profile on the Faculty menu, then click Personal Information. Show Empty Sections: Specify if sections that do not contain any data should display on your vita. Hide Vita Name: Specify if the vita name should display on the vita. Hide Attachments on Vita: Specify if links to attachments should be visible or hidden. In the Content section, use the Reorder drop-down to select the sections to be included in the vita, and the order in which you want them to display. When you are finished, click Save and Preview at the bottom/top of the Content section. The View Vita screen displays. If necessary, change the type of vita, the citation format, and the date range for the vita you wish to view. Click Refresh Report. Biosketches are similar to vitas; however, some sections are required to be included in a biosketch and can't be changed, as this could make the biosketch out of compliance with the granting agency's guidelines. 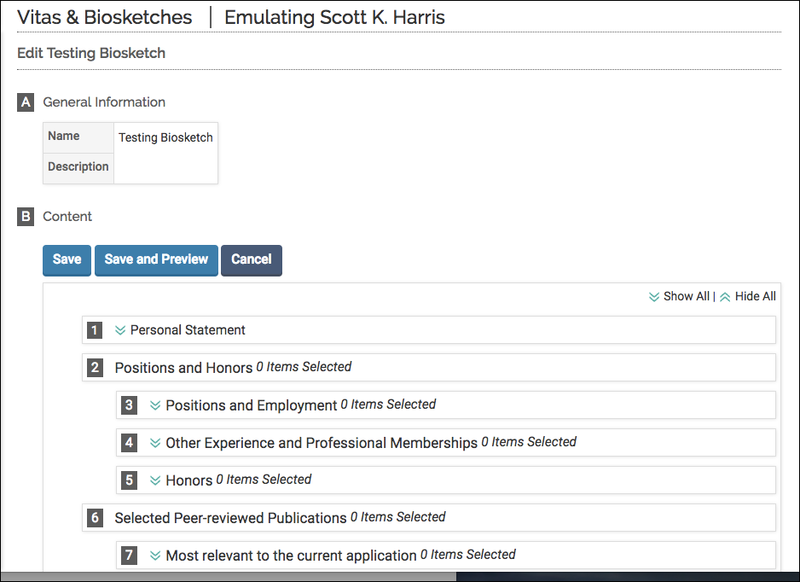 Within a section, faculty members can select which items to display in the selected biosketch. In addition, date ranges for biosketches are typically locked to comply with the granting agency's guidelines. When you are finished making your selections, click Save and Preview. The View Vita screen displays. If necessary, change the type of vita/biosketch and the citation format. Click Refresh Report. 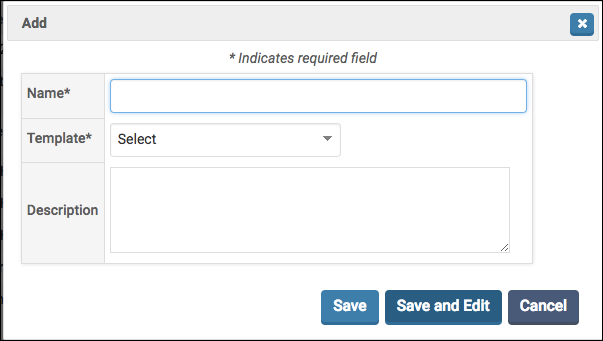 The NSF biosketch will display activities recorded in a Rich Text Editor format if and only if that activity is in a custom section and that custom section only has 1 field. This content is only for users AND institutions that have Dossier Institution. 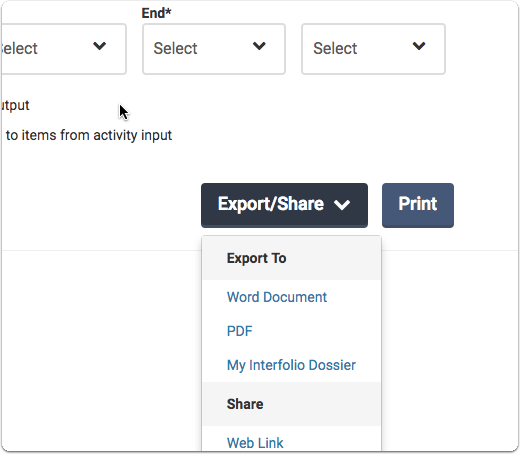 Faculty users in Faculty180 that have a Dossier institution account will be able to export their CV directly to their personal Dossier for personal record keeping purposes and future storage.